Here's an interesting video illustrating the basics of kanban from a university in Cuauhtémoc, Mexico. Unfortunately the dialogue's in Spanish, but you should be able to get the gist of it without knowing the language. 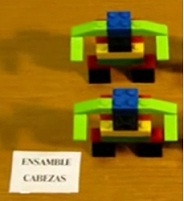 Or if you have a Spanish speaking group, this video explanation of kanban might be perfect! The first thing that caught my eye in this video was the Lego robots. I'm a sucker for Lego and robots, so I knew I needed to investigate further. The video shows a table laid out with everything needed to make Lego robots in a production line fashion. There are finished robots ready to ship and groups of sub-assemblies spread out in different areas on the table. Everything is clearly labeled. After introducing the components, the narrator runs us through a production cycle and shows how a replenishment kanban system works. By "shipping" two robots to the customer, he immediately creates space in the finished robot area. To fill this space, two robots are then fabricated from the subassemblies of bodies and arms. Upstream processes react this new void and create two new body subassemblies. Until all the small sub processes have responded and filled up the inventory back to predetermined levels. This is how kanban works. The customer order triggers the processes to replace parts taken. Parts are pulled from each process, never pushed when there's no demand. Since the video is in Spanish and my Spanish is non-existent, there may be some explanation of customer pull rates, process times and determining the correct inventory levels between each process. These are critical things to consider when implementing kanban in real life. If anyone reading this can provide a rough translation of the presentation, I'd love to read it. For a direct link on youtube, click here. 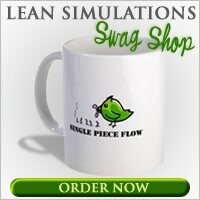 I've added this to my list of free lean videos.